This evening Arsenal Football Club announced the departure of Croatian international Eduardo da Silva. The 27-year-old joined Arsenal in the summer of 2007 and throughout his first season with the club was making steady progress with his development with English Football. He came to the fore with starts in the Carling Cup. I remember his brace against Sheffield United when I knew Arsene had found a gem. His touch and coolness in front of goal - as well as his ability to seem to score whenever he got the ball in the box - made may Arsenal fans think we'd found the 'fox in the box' Arsene Wenger had hoped Francis Jeffers might have been. It wasn't until the second half of the season when Eduardo performances were making him a natural starter for the club within the league. And then on that fateful day in February 2008 the world came crashing down on him. A horrific tackle by Birmingham defender Martin Taylor snapped our strikers leg and dislocated his ankle. The tackle was so bad that Sky Sports who were broadcasting the match live refused to replay the incident. Eduardo spent exactly a year out of the game. He made his comeback in February 2009 but was never the same player again. In his three seasons with Arsenal he made 67 appearances and scored 20 goals. He joins Ukrainian champions Shakhtar Donetsk for an undisclosed fee. 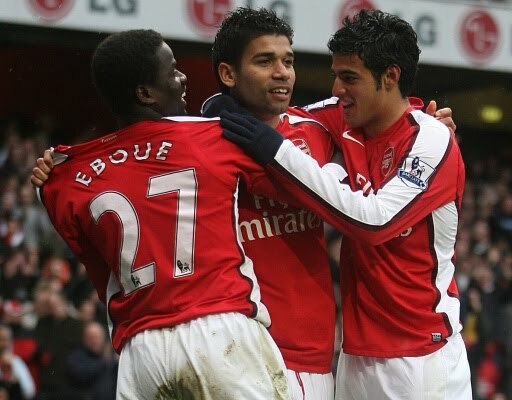 From what I understand, Arsene Wenger wanted to keep Eduardo with the squad this season. But the player, knowing his chances were limited by those in front of him and wanting to play regular first team football decided it would be better if he left the club. I have so much respect for Eduardo as both a football player and a man. It shows you how much determination he has to come back from the injury he suffered and not want to sit out his Arsenal contract but to go elsewhere when he knew he had limited options at Arsenal. I wish him the best and hope he rediscovers his form at Shakhtar Donetsk. I know he'll always be thought of highly in the red half of north London.